John Giannotti's winning design for the Hadrosaurus foulkii sculpture. Arts Department, has been selected to design and create a one-ton sculpture of a dinosaur for Haddonfield's business district. 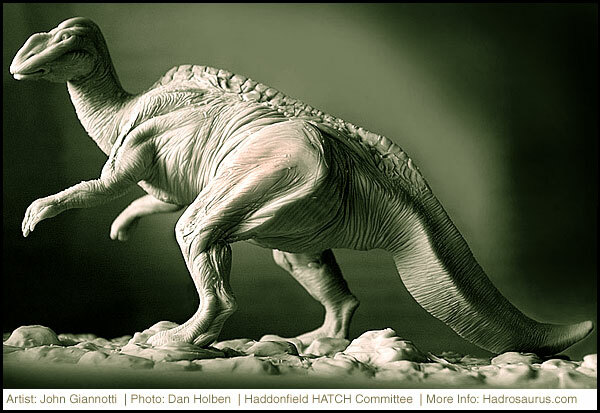 At a borough commission meeting last week, HATCH, the local civic group overseeing the project, also unveiled a model of Giannotti's winning Hadrosaurus foulkii design. The 56-year-old Haddonfield resident, who runs Giannotti Studios in a barn behind his home, was one of five sculptors vying for the project. To be cast in bronze, the eight-foot-high, 15-foot-long statue of the prehistoric beast will be the centerpiece of a landscaped garden area in Lantern Lane, a pedestrian walkway in the center of the historic town's village-like business district. Sculpture John Giannotti is the former Chairman of the Rutgers University Fine Arts Department. foulkii have been displayed for 144 years. Retired from Rutgers, Giannotti is a professor emeritus and a painter and sculptor of international reputation. His works have appeared in solo gallery exhibitions in Italy, Britain, Canada and the U.S.
On Sept. 11, his large "Victims of Terrorism Memorial," will be dedicated at Cooper River Parkway in Pennsauken. Commissioned by the Camden County Freeholders, it is a memorial to victims of terrorist attacks ranging from the 1988 bombing of a Pan Am jet over Lockerbie, Scotland, to last year's Sept. 11 attacks in New York, Washington and Pennsylvania. Other local Giannotti public sculptures include an eight-foot statue of Walt Whitman that now stands in the Children's Garden of the New Jersey State Aquarium, a full-size bronze fireman carrying a child to safety down a ladder commemorating heroism at the Chews Landing Fire Company, and a playful line of bronze shark's fins that cut across the lawn in Cooper River Park.